Add the rice to a pan of boiling water and simmer for 20 minutes. Add a little spray of olive oil to a pan and add the chicken. Cook for 10 minutes and then add the chilli, garlic, onion, paprika, cumin and salt and pepper and cook for a further 3 minutes. 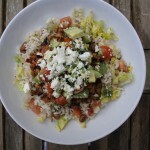 In a bowl, mix together the tomato, avocado, coriander and feta and put to one side. Divide the lettuce between 2 bowls and once the rice is cooked, drain it and stir in the lime juice and put on top of the lettuce. Top with beans, cooked chicken and the avocado salsa and serve.